Christer Egerstrom and Bello Oriente. Photo: ©SusanJStickle. 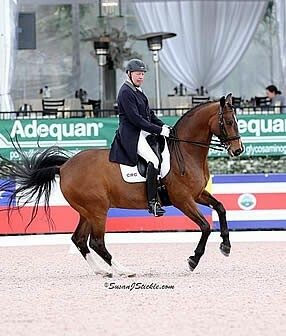 Wellington, FL – February 28, 2016 – Christer Egerstrom (CRC) and Bello Oriente won the FEI Intermediaire I Freestyle, presented by Engel & Völkers, topping the class with a score of 71.708%. This earned Costa Rica their first FEI win at the Adequan® Global Dressage Festival (AGDF) this season. Competition at AGDF will resume on Wednesday, March 2, with the start of the AGDF 8 CDI-W Palm Beach Dressage Derby, presented by Everglades Dressage, and conclude on Sunday, March 6. 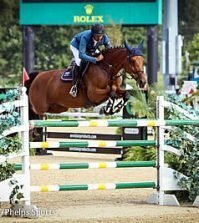 Juan Antonio Jimenez Cobo (ESP) and Elevado finished in second with a 69.792%, while Michelle Batalla, also representing Costa Rica, finished in third with a 64.792% aboard Hendrix. Egerstrom and Bello Oriente performed a lovely and accurate test to cap their week-long campaign in Small Tour competition at The Stadium at Palm Beach International Equestrian Center (PBIEC). Bello Oriente, a 2004 Oldenburg gelding (Belissimo M x Maradonna) owned by Egerstrom, is beginning to show consistent strength in expression and self-carriage, which is a main focus for Egerstrom as he will look to move the gelding to Large Tour competition next season. “He’s a good horse; I really like him. I think right now since we have a little bit of time with Rio out of the question, my idea would be to prepare him to try to head to Tokyo, Japan, for the 2020 Olympics. We have a very generous new sponsor, Denise Garnier, and she’s been incredibly supportive,” Egerstrom continued. It’s a family affair for Egerstrom, whose wife, Michelle Batalla, finished in third place in the class, also representing the nation of Costa Rica. 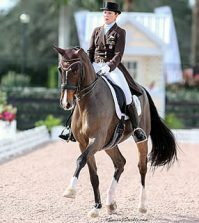 The duo has big plans to secure a spot for the small nation of Costa Rica in dressage at the next Olympic Games. “The idea is to try to get Costa Rica to the Olympics for Tokyo between to the two of us. That’s the objective. We have a little bit of time, and I think maybe next season we’ll come out at the Grand Prix level here,” he continued. Egerstrom is building a strong string of horses he could take as possible contenders, and Bello Oriente is only improving with experience in the ring. For Egerstrom, competing at AGDF has given both the necessary tools to feel secure in a move to Large Tour next season. “I have another candidate that could also do the Grand Prix, so between the two of them I’m very hopeful. We’ll do the next few CDIs here because you have to get down the centerline and experience it. That’s the only way that you can see what you need to do. It’s about getting the experience and that’s what we’re here for,” noted Egerstrom. Bello Oriente, a flashy bay gelding, seems to have all of the makings of a talented Grand Prix prospect for Egerstrom as his natural balance has been a major influence in his training progression over the past year. “Actually he has four great gaits and the trot, as his self-carriage continues to get better, is pretty spectacular. It’s getting much better, but the canter is good in and of itself. It’s there for the Grand Prix right now, but I don’t want to rush him into it. He’s doing everything, but I’m going to take my time and get it there correctly,” he continued. 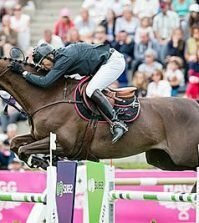 Juan Antonio Jimenez Cobo (ESP) and his own Sunny Boy finished the afternoon with a win in the FEI Consolation Grand Prix, earning a score of 66.000%. 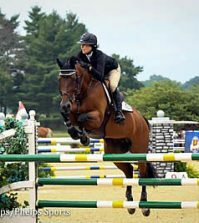 Joanne Vaughan (GEO) and her own Elmegarden’s Marquis received a 64.867%, while Evi Strasser (CAN) piloted her own Renaissance Tyme to third place with a 64.833%. Competition at AGDF resumes on Wednesday, March 2, with the AGDF 8 Palm Beach Dressage Derby CDI-W, presented by Everglades Dressage. For more information on AGDF, please visit www.globaldressagefestival.com.